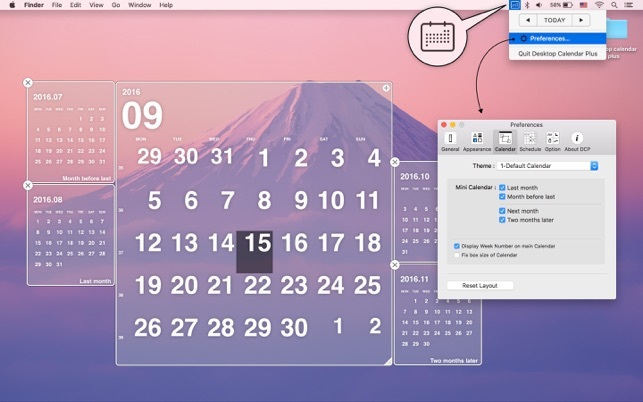 Customize your Calendar design intuitively, and Display your calendar on your original desktop picture ! 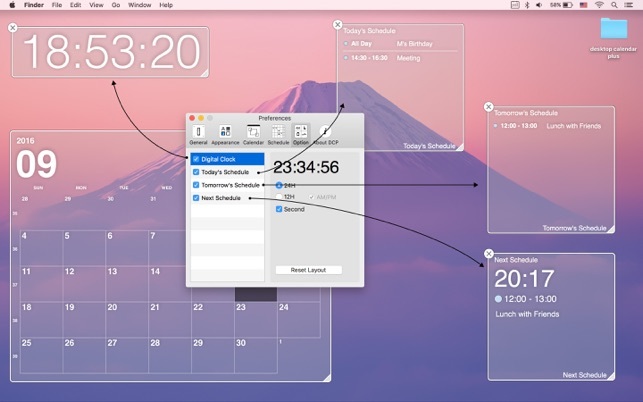 At Mission Control and Show Desktop at Expose, display your calendar quickly. Display the calendar as bigger as you can, or as smaller as a compact calendar, you can modify the size and layout. Changing colors, fonts, shadows, box lines so easily and intuitively. 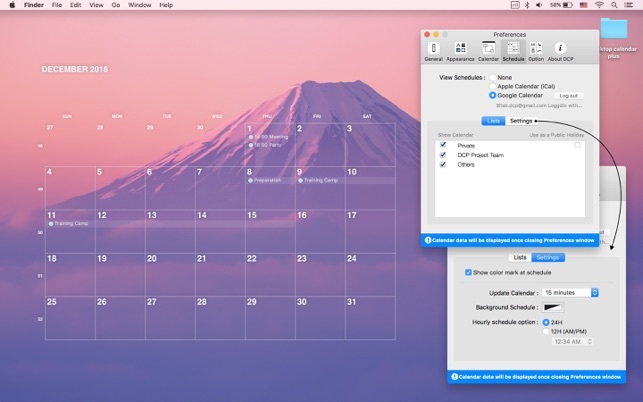 Up to your desktop pictures and your settings, you can create your unique designed calendar you have ever experienced. As our design preset is ready to use, you can customize its desing so easily. Of course, Save your preset by your own preference. From Menu-bar button, you can switch to last month, current month, next month or back and forth smoothly. Specify each color of today, weekday to holiday, so that each one of day shows up in your preferred color. So easy to recognize which day it refers. Set beginning day of week from Monday to Sunday, or let's say, set your favorite beginning day of the week. Support for Google ics format. Add calendar of your country and display its holidays. Display small calendars from before/after 2 months. 4 months can be displayed on your Desktop. Sure, calendar positions are allocated easily. In the future..., New Calendar theme will be added. 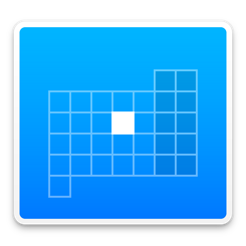 Support for Google Calendar and Apple Calendar (iCal) events. 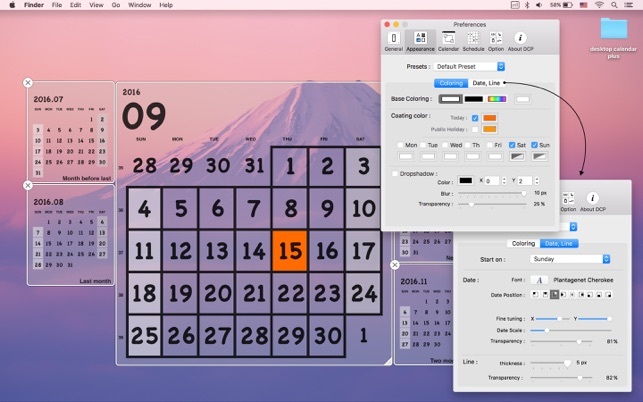 Up to resolution of your monitor and multi-monitors, Desktop Calendar Plus saves your layouts. Once Setting up your original Calendar layouts on each display, your layouts are saved automatically. Switching your monitor usages, you don't need to set up your preferred layouts again. Sorry, In this version, we will end the support of OS X 10.6 and OS X 10.7. • Optimized for macOS 10.12 (Sierra). • Fixed: A bug when reading the Saved preset. • Fixed: An issue related to use memory. • Deleted the date display of the main calendar. • Deleted reset layout menu. It works well as designed. I would like to see a few changes to make it really useful. First, when you get toward the end of the month the calendar view becomes of little value. It would be nice to see the “next 4 weeks” rather than the current month. Second, even better, would be a list view of all upcomming events. The no long supported iDeskCal app was great for this. You could see a list of upcomming events on the desktop, without having a big calendar. I like this calendar. I was hoping that the background of the calendar could be made solid white instead of transparent only. I would like the option to have the Month Name on the calendar instead of the number of the month. That being said, I would recommend this app. what a waste of money. I added birthdays and also work schedule; some show up perfectly as typed; others say in very small print,(others, 1). I can click on that and see what it is referring to but that’s not what I thought I was paying for. I thought I was getting at a glance, calendar. Please advise, uptdate the app or return my money.